The Perfect Diet Tracker has been the #1 selling diet software application available on the Mac App Store in the past 18 months! Over and above this achievement, at the time of writing the Perfect Diet Tracker is also currently the #1 selling app in the entire App Store Health & Fitness category in the United States, Canada, UK and Australia and in the top 5 in most other countries worldwide. We believe this is simply because the Perfect Diet Tracker is the best diet app available for the Mac, bar none! Click here to open the Mac App Store now. 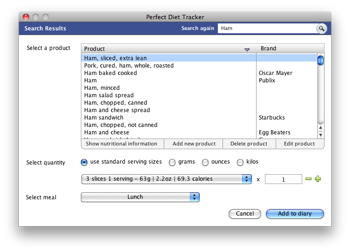 The Perfect Diet Tracker is not only been designed to work perfectly on your Mac, it is actually written by us using Mac computers. Byoni made the switch to using Macs approximately 5 years ago and we have not looked back. We believe using Macs gives us the capability to produce software that is simply better for all platforms including both Mac and Windows computers, and more recently Linux and mobile devices as well. 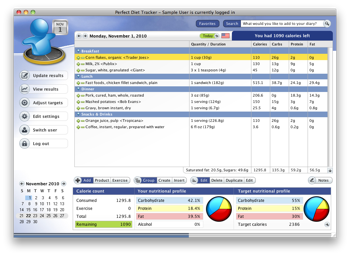 We try and test the Perfect Diet Tracker on all supported versions of OS X including the latest Mavericks release and older versions such as Mountain Lion, Lion, Tiger and Snow Leopard. When we are happy we then send a copy to Apple for their review prior to publication on the Mac App Store. It is a very thorough process and ensures (as you would expect as a Mac user) that everything 'just works'. We have a 'more information' web page with (as the name suggests!) more information about the way in which the Perfect Diet Tracker works to help you lose weight and keep it off. You can now sync your diary with the Tracker2Go app on your iPhone, iPad or iPod Touch providing even more convenience and flexibility. Tracker2Go is designed to work perfect with the diet tracker, any products you add to the Mac desktop software automatically become available when you sync with the Tracker2Go app. We have taken 'screenshots' of most of the screens in the App so you can see how different sections work. 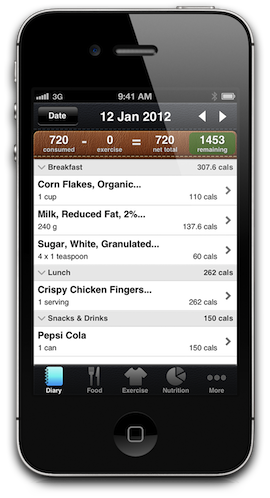 The software is based around a main diary where you track what you eat. You can add to the diary from the extensive food and exercise databases, and monitor your weight loss in the reporting sections. Above all however, the software is designed to be easy to use!